Call it a red wave. A new analysis of social media leading up to the World Series shows that the vast majority of states in the U.S. are pulling for the Boston in the World Series face-off with the Dodgers. The results were compiled by a website called SportsBetting.ag, which specializes in, well, you know. To gauge World Series sentiment, its number crunchers tallied up the social media posts on Twitter for and against each team in each state, focusing on the official hashtags for both sides, including the tough and cool #DoDamage for the Sox and the limp and wimpy #LADetermined for the Dodgers. Only California, Hawaii, Nevada, and Delaware logged more pro-Dodgers tweets than pro-Sox tweets. 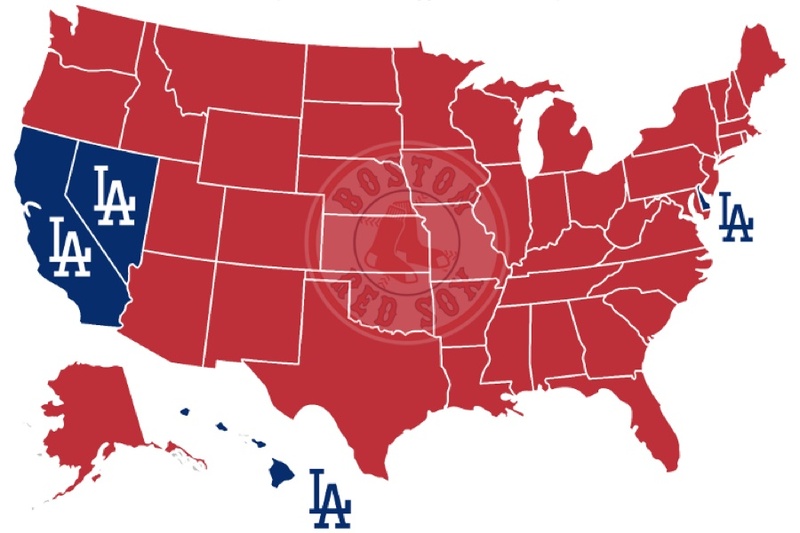 Californians showed support for their team 79,400 times, compared to the 11,100 times Sox fans spoke up in that state. In Massachusetts, there were 39,500 tweets boosting the Sox, compared to just 650 rooting for LA. They’re even leaning pro-Sox in New York, apparently. You can read the full results here. It’s a changing of fortunes for us. Last time we got ahold of similarly (probably) trustworthy data on the national mood about a local franchise in a championship face-off, we found out most of the country was firmly anti-Patriots ahead of the Super Bowl. In fact, outside of New England, only the good people of North Dakota were apparently siding with Brady, according to a “sister website” called BetOnline.ag. And guess what. North Dakota, you rascals, you’re apparently with Boston once again. SportsBetting.ag found that social media users in the state are overwhelmingly supportive of the Sox: with 1,700 pro-Sox tweets to the Dodgers’ 84. So to most of the states in the union, and especially the North Dakotans, we salute you. Go Sox.